Recording a video has never been so simple! It's time for your first video recording! We put together this quick video to help you get started with Loom on day 1. Please keep in mind the Chrome extension will not have Pro recording features. For more information on the desktop app and these features click here. Note: in order to record, you will need to have Loom's extension correctly installed in your Google Chrome browser. You'll want to pay special attention to the Recording Settings that will appear. 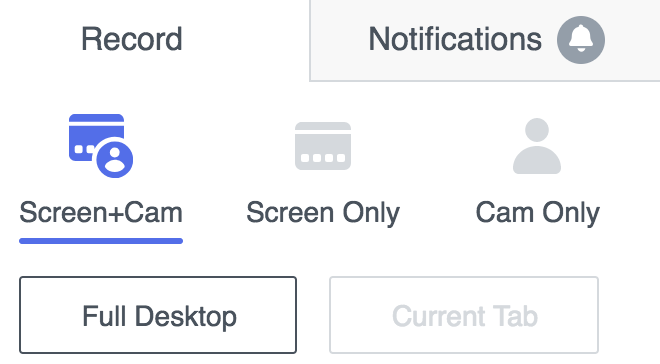 For the options Screen & Cam and Screen Only, you will also have the option to decide whether if you want a Full Desktop or Current Tab recording. Additionally, advanced option are provided where you can customise your microphone & camera inputs, and whether you'd like to show/hide your camera controls.